Bayhorse Silver Inc. (V.BHS | OTC.KXPLF | Frankfurt F.7KXN ) has a highly experienced team of mining engineers geologists and miners to actively bring its Bayhorse Silver Mine to production. Using a Steinert Ore-Sorter, we are marrying advanced technology with standard mining techniques to promote environmentally friendly and low-cost mining. Bayhorse Silver Accesses additional 1,500 feet of 1984 Historical Workings, Bayhorse Silver Mine, Oregon, USA. The 37 ounce historic first pour is the first of many. What is in the pipeline right now and what can shareholders expect over the next few months? Mineral Solutions is currently identifying the right particle size of the rock to get maximum recovery of the silver. They also want to do a combination of flotation and gravity work to get the highest concentrate grade to process through to refining, to achieve at least 98% plus recovery. As we determine the exact grind particle size, we will change the configuration of the crushing grinding circuit to suit. Getting it right the first time is the difference between making it or breaking it, and many mines have had costly overruns by not getting this stage right. Just as we have had lots of very talented people get the mining right, we have extremely talented people doing the processing/refining stage. Better to be patient. This will not be done overnight. We are looking to do a vertical integration of all the stages through to the final refining .9999 fine, or four nines. For comparison, LBMA good delivery bars are +/- 1,000 ounces and are only .999 fine, or three nines. Due to the nuclear winter in the markets this past eight months that starved everyone of working capital, including Bayhorse, we did not get to the high-grade zones until late September. Which is why we are late getting all this work done. Mines take money before they make money. Going forward, Apex Geoscience will conduct the geological mapping and decide what we will mine first. While that is happening, we will put a new working drift into the Big Dog zone to enable bulk mining from two working faces, the Goldilocks and the Big Dog zones. At the same time, subject to financing, of course, we will complete rearranging the primary and secondary crushing circuits, to speed them up and reduce identified bottlenecks. By the time that is finished, Minerals should have finished their work, and we should be well underway mining, processing and refining. Does the Mineral Solution process allow the recovery of other metals in the Bayhorse Rock. What are those metals? The Bayhorse mineralization is a polymetallic deposit, mainly Tetrahedrite, that is copper/silver, but also carries lead, zinc, and antimony as the minor metals. One of the problems with any refining process, is how to separate these minerals cost effectively. For Bayhorse mineralization, silver and copper are the primary metals and to refine them the rest have to be suppressed in the concentration stage. This is why so many small mines have problems getting their concentrate to market. Smelters and refiners have almost disappeared in North America, with most now offshore. Every smelter has a primary metal that they process. For example, the Trail smelter primarily does zinc, with lead and silver. It does not do copper. Others do copper, silver, and gold, but not lead, zinc, and antimony. So, they either won’t take the ore, or charge an arm and a leg to the mine to get rid of what they call, “deleterious metals” that interfere with their recovery process. So, we will probably get copper along with the silver, and try to defray the cost of getting rid of the lead, zinc, and antimony that will cause problems in the refining stage. In terms of mining, have you identified a reasonable quantity of high-grade rock? What sorts of grades are you looking at and how much of that rock have you identified? While we have identified what we believe is a reasonable quantity of high grade, we are leaving it up to Apex Geoscience to determine the tonnage and what the mining grades will be and guide the miners to get the most out of the mine. If you have a one-foot thick zone of 300 ounces a ton, you cannot mine that narrow, so it will have to be averaged over the actual mining width, that could be four or five feet, so that brings the average grade down. Mind you, the ore-sorter takes care of a lot of that waste, but waste still has to be mined to get the good stuff. The material we sent to Minerals was averaging 300 oz per ton silver. This is without sorting. Straight from the mine face to Minerals. That gives an indication of the very high grades in the mine, and why Apex was able to establish the average 21.65 ounces per ton in the 43-101. The miner’s adage, is drift into the high grade as narrow as possible and get the high grade to pay off as many of the upfront costs as possible, then when backing out, slab off the lower grades and leave as little behind as practicable. Is your current Private Placement still open for subscription? Yes, it is. Mining costs money, and to get to where we have positive cash flow we need additional funding. Will you be announcing new pours with recovery rates as they occur? Yes, we will. Minerals is being very careful in evaluating the silver recovery, just as we have been very cautious in everything we have done so far. Our goal is to get 98% plus recovery. The 1984 mining program was really concerned about recovery rates, as they were not up to their expectations. That is why we are leaving no stone unturned in identifying the right crush/milling particle size, for flotation and leaching. The recovery numbers will be variable at first until we get the process fine-tuned, but we are encouraged by the preliminary results. What is Bayhorse’s time line to commercial production and can Mineral Solutions scale to meet that production? That is what the next couple of months are about. Minerals getting their part right, and telling us what we need to do to give them the right stuff, so we get our part right. This should all happen concurrently during this time. We will gradually ramp up to full production over the next few months. Hiccups will occur, but we have talented teams to take care of them. At this point, what is the estimated all in cash cost per ounce of silver from the Bayhorse mine using the Mineral Solutions process. Ah! That is the 64 dollar question. We have our internal numbers based upon the last two years of underground operations, and have put in a hefty number for the processing refining stage. We are targeting an all-in cash cost of US$10.00 per ounce, or less, but it will probably take 12 months of operations before we can say for sure what our exact costs are. Mind you, some of our costs should be lower, because we do not have to ship containers of concentrate to China, or suffer the low smelter payouts. Then there is VAT that does not get charged, nor potential tariffs. All in all, we are much better off with Mineral Solutions. We believe the mine will be profitable, or we would not be doing it, but ask me again in six months. Bayhorse Silver Inc., (TSXV: BHS) (“Bayhorse” or the “Company”) is pleased to report that Mineral Solutions LLC, (Minerals) of Coeur d Alene Idaho, has produced the first refined silver from the high grade silver mineralization shipped to them for processing from the Bayhorse Silver Mine, Oregon, USA. Producing this first bar, containing 37.69 ounces (1.172 kg) of .9999 fine silver, with the Liberty Refiner Purity Mark, has demonstrated the effectiveness of the Minerals process on the Bayhorse mineralization. The silver bar was extracted from a portion of the 175 kg (386 lb.) of the samples sent to Minerals as reported in the Company’s news release BHS2019-01 issued on February 6, 2019. Additional 12 kg samples of silver bearing material, extracted directly from the Bayhorse Bonanza Vein, and unsorted, has been shipped to Minerals. This sample assayed 338.5 ounces/ton (10,528.5 grams/ton) silver. The Company has shipped in excess of 175 kg of unsorted Bayhorse Silver Mineralization, of a variety of grades, up to bonanza grades, to ensure that Minerals has sufficient grade variation of samples to optimize silver recovery from their silver processing and refining process. The Company is working closely with Minerals in other areas of upgrading and processing of the Bayhorse mineralization through upgrading to refining to ensure we meet our goal of 98% plus silver recovery. The samples were split according to ASTM sampling protocol. Assaying for the samples reported above was conducted by Christopherson Umpire Assayer of Osburn, Idaho. The analytical method used for the silver analysis consists of 1 Assay Ton (AT) samples subjected to fire assay with gravimetric finish. Base metals assay for the samples are subjected to an ICP 35 element, four acid digestion assay. Fire assays were done in duplicates with corrected silver. It’s not everyday that a friend and client pours their first silver. Bayhorse Silver (V.BHS) just did. Update: A picture is worth a 1000 words but here is the press release to accompany the above picture. Our friends over at CEO.CA do a stockpicking contest every year. This years is open until January 6th so go here https://ceo.ca/@evenprime/2019-stock-picking-contest and give it your best shot. We don’t do a lot of stock picking at motherlodetv.net but we obviously pay attention. Below are not recomendations, they are simply three stocks I think will do very well in 2019. I post under a pseudonym and here are my picks V.BHS, V.WGO and V.PRG. Two golds and a silver. The logic? 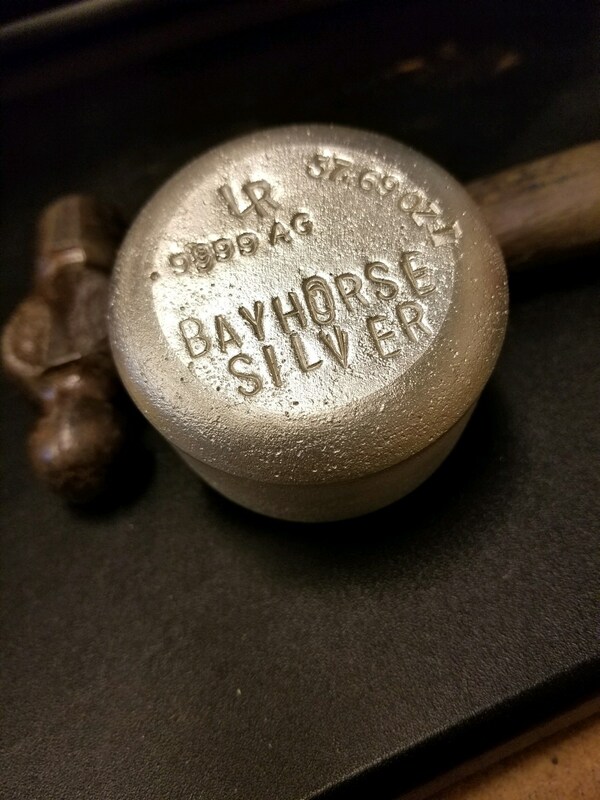 Well, Bayhorse Silver (V.BHS) has a silver mine in Oregon which is all of an inch away from shipping silver concentrate. Call it three months to actual silver production. My own view is that silver is going to outpace gold as precious metals come back from the doldrums. But a real producing mine with an upfront, already paid, cost of about 7.5 million dollars is a great start. Add to that the fact Graeme O’Neill has found a great big block of high grade material which is being mined and the fact he already has an ore sorter in place to separate the wheat from the chaff and you have to think V.BHS is going to trade for a multiple of its closing price of $0.12. White Gold (V.WGO) is a completely different story. Right now it is a pure exploration play in the Dawson Range in the Yukon. It is a Shawn Ryan project with serious financing from Toronto. It is somewhat unique in the junior exploration space as it has strategic investment from two majors: Agnico Eagle and Kinross Gold. This is very much a district play with recent results suggesting that there is high grade gold close to surface. This year WGO drilled both its Golden Saddle and its JP Ross property targets and pretty much could not miss. And when it hit it was seeing gold values on the order of 15 to 30 gpt. Critically, while White Gold is exploring using helicopter driven methods, there is a road from Dawson City to the White Gold properties. No small thing in the Yukon. If WGO can establish a series of pitable deposits on its huge land holdings there is every chance its already strong share performance will continue. And if the price of gold keeps going up steadily, every ounce of reserves WGO discovers will add to its market cap. Precipitate Gold (V.PRG) is a straight gamble. Precipitate has land directly adjacent to Barrick’s huge gold mine in the Dominican Republic. They have a geological theory which, in simplest terms says that there is a deposit of similar size buried beneath a “cap” of material about 200 meters thick. So, drill ten holes and see if the theory is correct. Most geological theories turn out to be wrong. However, PRG has a Board which tends to be right. I’ll bet on Quinton Hennigh (NOVO) any time. And the rest of the Board are seasoned explorationists. CEO Jeff Wilson will keep the money coming and the communications on track. But this is “drill to kill”. Pure hypotheses testing. If one of the holes hits mineralization the stock will run. How high? No idea but to win the stock picking contest I need a 10 bagger but, to kill it, I want to see NOVO like stock performance. This is a crap shoot. If none of the holes hit it will drop back to $0.05 on the value of its other projects; but if one or two hit, Wilson will make sure the world knows and the CEO.CA stockpicking contest is mine. The CEO.CA stock picking contest is just for fun. But worth looking at for new investment ideas. Our friend Graeme O’Neill, CEO of Bayhorse Silver, (V.BHS) sent a Go-Pro camera to the face with his miners. Not slick, not edited: just experienced miners looking at a pile of rock after blasting into what they hoped was a “High Grade” zone. O’Neill hopes to have more video next week. Bayhorse Silver Inc. (TSXV: BHS) (the “Company” or “Bayhorse”) announces, subject to TSX-Venture Exchange (TSX-V) approval, it has closed a 2nd tranche of is three year, 12%, Convertible, Silver-Convertible, Debentures (the “Debentures”) for gross proceeds of to US$465,000. Total proceeds to date from both the 1st and 2nd tranche is US$690,000. Subject to approval from the TSX Venture Exchange it is increasing the Debenture financing from 200 Units to 220 Units, for gross proceeds of US$1,100,000. The Debentures shall bear interest at a rate of twelve (12%) percent per annum, payable annually in arrears. Additionally, at the election of the Holders, the Debentures will be convertible into common shares of the Company at C$0.125 cents per share in accordance with the policies of the TSX-V, or, conditional upon notification by the Corporation of silver production, the Debenture holder may elect to convert the Debenture principal and accrued interest into ounces of silver at a conversion rate of US$15.50 an ounce. Each Debenture shall entitle the Holder to twenty thousand Warrants the “Debenture Warrants”) exercisable into common shares of the Company at Canadian $0.25 per Debenture Warrant Share until three years from the date of issue. In addition to any other exemption available to the Company, participation in the Debenture financing is also open to all existing shareholders, even if not accredited investors, under the “existing shareholder” exemption of National Instrument 45-106 as promulgated in Multilateral CSA notice 45-313 in participating jurisdictions. Graeme O’Neill, a Director and Officer of the Company is subscribing for 5 Debenture Units for a total to date of 35 Debenture Units. Rick Low, an Officer of the Company is subscribing for 3 Debenture Units. This News Release has been prepared on behalf of the Bayhorse Silver Inc. Board of Directors, which accepts full responsibility for its contents. Bayhorse reported a 6 million ounce 43-101 compliant inferred Why not measured and indicated? With respect to the Bayhorse Mine, we built the mine first, based upon the extraordinary amount of solid geological data we obtained, paid for by someone else I might add. Then, using that additional data we developed during building the mine, we established the inferred resource. Taking an inferred resource to a reserve would cost us an enormous amount of money. We are in the middle of a silver jewellery box, where the previous operators drilled out and defined 26,000 tons of high-grade silver. Based upon our anticipated daily mining rate of 100 tons/day, that is close to one year’s mining available to us at right at our fingertips. The old-timers rarely had more than a year of blocked out “ore” ready for mining ahead, and during that year of mining, they replenished it so they always had that year of operations ahead of them. So do we need to develop ten years of material ahead at a huge upfront cost? Or should we keep developing a year of material ahead of us at a minor cost? We are practical people and we don’t spend money we don’t have to. I am sure everyone knows about the Pareto Principle. It says that 80% of results come from 20% of effort, or expenditures. It is true for pretty much everything. Typically, a company raises money to explore, finds mineralization, explores some more, drills and drills and drills, and comes up with a resource, which it takes to a measured and indicated reserve and then does a PEA and then a full feasibility study. Then, once financing is secured, after spending a substantial amount more money, and lots more time, they permit and build the mine. Then, a year after they open the mine, they probably start to generate revenue. We did it backwards. Built the mine, with a brand new 900-foot haulage way, a 100 ton a day, state of the art upgrading facility, and then we established the resource, and are already mining: all for $5 million. It would cost another minimum $5 million to bring the resource to measured and indicated reserve status. We would rather spend that money mining, upgrading, and getting cash flow. There is still a lot of work to do, such as getting ready for winter, but we are well advanced at that, so we have no disruptions during the winter months. Everyone wants a guarantee. What we guarantee our shareholders and investors is that we are doing what we said we were going to do, and delivering on it. Maybe late, but delivered nonetheless. But proper funding is required to get anything done. Does Bayhorse have a processor available to ship material to? We do, and we have indicative proposals to sell any concentrate we make to smelters, with proposed payment at the mine gate when picked up. But we are constantly looking to improve our bottom line. For example, using flotation, typical recovery is 90%, and our testing has shown that we will get the typical flotation recovery. Then the smelter will pay us 90% of the spot price of silver for the concentrate. Deductions after deductions. That reduces the bottom line. In the event we build a Total Metals Recovery processing facility as proposed by Metals US, we will get pure silver, and eliminate sending concentrate to smelters and refiners, and the attendant costs of shipping to the smelter and refinery. At this point what does Bayhorse have to do to begin mining out its 1000 ton block? What are your plans to extend the resource? Apex Geoscience is drafting up a drilling program so we can bring the conceptual exploration target into a resource category. A number of 200-foot holes from inside the workings extending outside the known mineralized envelope. There is sufficient geological data to believe the zone dips to the south and to depth. The old-timers mined used hand steel, not today’s pneumatic drills, very labour intensive, to open the workings up. They were very experienced and would not have done it if they didn’t believe something was there. Once you begin mining what is your estimated throughput per day? Can that be increased? You are using a “Conceptual mining and processing costs were estimated at $US100 per ton of mineralized material” and an “average grade of 21.65 troy ounces per ton (opt) silver (Ag)”. If I divide 100 by 21.65 I get a cost per ounce of $4.60. Is that roughly correct and what does it say about the profitability of the Bayhorse Mine? We have a substantial amount of cost data developed during this past year. Mining costs, maintenance costs, upgrading costs, however, it is only after operating for a year that we can say with certainty what the actual costs are. Of course, we have a good handle on the mining costs, that are under $50/ton, but again, taking out large blocks is a little different from driving a haulage way, and we have to support a much larger back. For reference though, the average all-in sustaining costs (AISC) for primary silver mine is around US$10.25 per ounce. That should be used as a rough rule of thumb until accurate numbers are developed after the first year of operations. Bayhorse Silver Inc. (TSXV: BHS) (The “Company” or “Bayhorse”) is pleased to announce the release of a Maiden Inferred Mineral Resource for the 100% controlled Bayhorse Silver Mine, Oregon, USA. The maiden resource is comprised of 292,300 short tons at an average grade of 21.65 troy ounces per ton (opt) silver (Ag) for total contained silver of 6,328,400 ounces. The mineralized material contains significant amounts of copper (Cu) and zinc (Zn), however the historic data utilized in the mineral resource estimate did not allow for a reliable calculation of the grade of Cu and Zn. 292,300 tons inferred mineral resource (See Table 1 below). 21.65 opt Ag grade (See Table 1 below). 6,328,400 oz of contained silver (See Table 1 below). Mineralized silver zone hosted in rhyolite with dimensions approximately 800 ft (245 m) along strike east-west, 200 ft (60 m) across strike and 23 ft (7 m) in thickness. An additional conceptual exploration target of 200,000 to 250,000 tons at a range of grades of 10 to 20 opt Ag for a range of 2 million to 5 million ounces of silver has been modelled. The additional exploration target is conceptual in nature, there has been insufficient exploration to define a mineral resource for the exploration target and it is uncertain if further exploration will result in the definition of additional resources. Grades for silver were interpolated into blocks by ID2 using the search ellipsoid dimensions and orientation established by variography. For the Bayhorse block models, the grade interpolation was completed in a series of passes with expanding search ellipsoids. As a verification tool for the selected ID2 block model, the composite average grades, the ID2 block model average grade and an average grade of an OK (ordinary Kriging) block model were compared along 20 m windows east – west, north — south and 5 m windows with elevation. Block grades matched the composite grades relatively well with no significant bias indicated in any of the modelled domains. What is the procedure for picking where to sample? We have an enormous amount of historical sampling data, however it needs to be put into the proper perspective from the paper plans to the actual physical location from where it originally came from. We have the original complete surveys, we have oriented it to this to our own survey of the underground. All we have to do then is to is establish the physical locations inside the workings to the plan and we have the location of the original drill samples, and the mined round samples. Then we have done channel sampling along the surface of the mined area to see if it coincides. Better than a drill hole as we have a greater surface area and depth of the samples. We mark it on the map, cross reference, and we have then replicated, as closely as possible, between the areas of high grade and low grade. We then mark and mine the higher grade. You report a variety of grades from fairly low to bonanza: will your ore sorter be able to upgrade the lower grade material? We call it upgrading, but in effect, the ore-sorter actually selects the mineralized material from the mixture of mineralized and non-mineralized material. Most systems take all the mined rocks, crush it to beach sand size, and then float it. That is very wasteful, both energy for crushing and cost wise for the size of the flotation plant. We are preselecting our rocks, so we only have to do final concentration on 10% – 15% of the gross mined material. That savings can go straight to the bottom line as our flotation plant will be very small. Probably 20 – 30 ton/day. As an example, the following photo shows a mineralized rock that has been broken so it can be crushed to the optimum size that will able to be sorted. The mineralization shown, is comparable to bonanza grades we have already tested, and the ore-sorter will probably select every piece of the rocks shown, as it is very heavily mineralized. Rocks that are sized smaller the 8 mm bottom limit of the sorter will be selected by the dense media system, so we will capture pretty much all of it. The next picture shows a rock that has both mineralized and non-mineralized material in it. 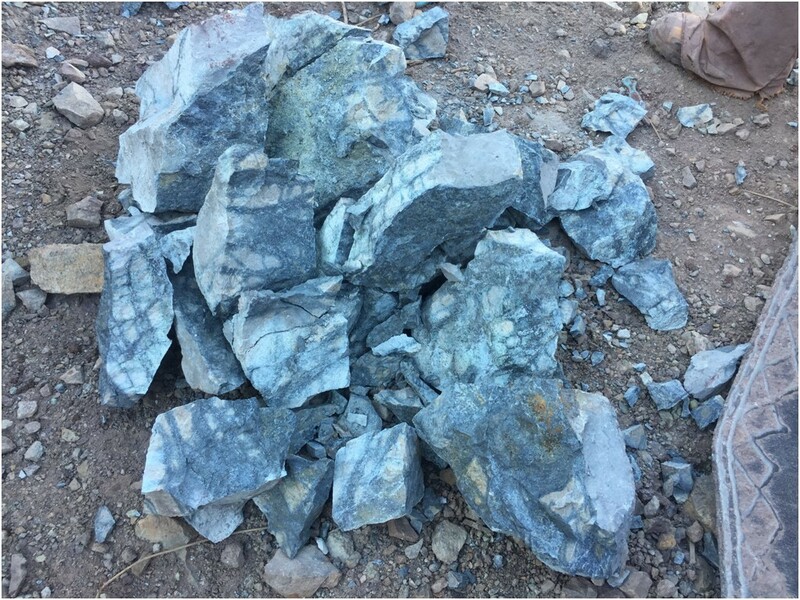 This rock, when crushed, is a good example of where the ore-sorter excels, selecting the mineralized and leaving the waste. Generally, anything with the darker streaks in it will be highly selective, while the brownish colored rock will be left. The majority of the mineralization is in the hard grey rock, Rhyolite. It fractures readily when crushed and the testing we have done shows that grades even as low as 1oz – 2oz per ton can be upgraded 15 to 25 times, and we will get to select a lot of mineralized material that would be normally be left behind as not recoverable. For example, when Silver King mined in 1984, they did not mine anything under 6 oz/t silver. Bayhorse is operating at the cutting edge of the technology that is available to recover as much as possible, even down to 1 oz/t to 2 oz/t. Of course, we will probably stay above 2 oz/t for practical reasons, but the ore-sorter is very selective with the type of rock we have. You are anticipating a 43-101 Resource estimate shortly. Will these samples be in time to be included? Yes. We have sampled extensively already, as well as done comprehensive testing through the sorter, and all the information, assays, etc, has been provided to Apex Geoscience for reference and inclusion in the report. You have historic data from the 1984 mining program. How well do the reported channel samples conform to the historic data? What the sampling has shown us is that it correlates very closely to what has been mined, and there is an enormous amount of rock that wasn’t touched in the old haulage way itself that is readily mineable with very little expenditure. We win both ways here. After all, we have around 1,000 to 1,500 feet of accessibility to the mineralization that we do not have to drift to get to. That is a substantial savings right there. Underground mining is highly technical. What do you take and what you leave behind. Almost like building a huge medieval cathedral. You have to support the roof and the walls so it does not fall down around you. In fact, Roman architecture was so good much of it is standing after 2,000 years through their use of arches and pillars, and that is the basis, even today, of modern mines. The miners are highly experienced in doing this, so much so they can tell in an old mine whether it is safe or not just by looking at the rock pillars and seeing how much stress it is taking. Mineralization is found, Mines are made. The silver prices are so low right now that many investors are totally disheartened and our share price has suffered, along with many other companies prices, because of it. But money makes and operates mines, and so to make a mine and make money you need development funds, and those is hard to come by these days, so we try and watch every dollar, because making a mine is an expensive proposition. On September 10 Bayhorse Silver Inc (TSXV: BHS) reported the first set of assays (BHS2018-28) on our channel sampling program at the Bayhorse Silver Mine in Oregon. Today we are very pleased to report further high grade assays on the next 21 channel samples bringing the total to date to 47 of the 60 samples submitted to the lab. During the 1984 mining program at the Bayhorse Mine, historic records show that of the tonnage mined, 23% graded between 21 — 100 oz/t, 71% graded between 6 — 20oz/t, with the remainder grading under 6 oz/t and the assays of the channel samples we have received are consistent with those levels of mineralization. In addition to the channel samples we are awaiting an assay of a 30kg metallurgical sample and the assays of the long holes we have drilled. Bayhorse CEO Graeme O’Neill comments “The channel sample assays to date appear to be showing a strong similarity to the silver grade percentages mined during the 1984 program. This comprehensive sampling program is in support of the Company’s NI-43-101 report, that is nearly complete, and to support the imminent removal and processing of a large mineralized block.” He also comments “we do not know how long silver prices will remain under pressure but analyst Clive Maund recently has written about the astounding number of short positions against silver that sooner or later must be covered that should lead to much higher prices”. The 60 channel samples, each measuring 0.66 meters (2.4ft) by 0.2 meters (6″), were taken on ten (10) foot centers with three components, from the back, and the left and right ribs for each sample site. All are from the westerly end of the newly accessed main haulage way. To complement the channel samples, a series of long holes, on fifteen (15) foot centers, are being carried out along 200 feet of the haulage way, commencing at the first channel sample location. The long hole groups consist of one vertical hole, one angled 70 degrees in the westerly direction along the haulage way, and one at 70 degrees into the right rib. Cuttings are being taken at one (1) meter intervals up the holes and submitted for assay. Both the channel samples and long holes are for comparison with historically reported and mined, both high grade and low grade material, and with the thickness of the mineralized zone, that was historically reported as averaging 20 feet. Further assay results will be reported as received. The Company is not basing any decision to produce on a feasibility study of mineral reserves demonstrating economic and technical viability and also advises there is increased uncertainty and specific economic and technical risks of failure with any production decision. These risks include drop in price of commodities produced, namely silver , copper, lead, and zinc, from the pricing used to make the production decision, failure of the grades of the produced material to fall within the parameters used to make the production decision, and increase in mining costs due to changes within the mine during development and mining procedures. There are also metallurgical recovery changes that cannot be anticipated at the time of production. Assaying for the samples reported above is by American Analytical Services Labs of Osburn, Idaho. The analytical method used for the silver analysis consists of a 1 Assay Ton (AT) samples subjected to fire assay with gravimetric finish. Base metals are subjected to an ICP 35 element, four acid digestion assay.